More than 12,000 dead in Mexico's prohibition-related violence as of November 30, according to the Mexican attorney general, and more than 30,000 since Calderon called out the troops in December 2006. 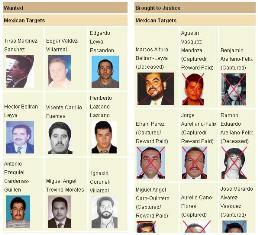 Zetas wanted poster, US State Dept. In Chihuahua, Marisela Escobedo Ortiz was shot and killed  in front of the governor’s office. Ortiz had been well-known for her protests and activism after the 2008 murder and dismemberment of her 16-year old daughter Rubi Frayre by her boyfriend Sergio Barraza. Barraza, thought to be a Zeta, was captured a year later in Zacatecas but was released after being exonerated by a Mexican court. Another court reversed the decision, but Barraza remains a fugitive. Barraza is thought to have ordered the killing of Ortiz, and had previously been implicated in several death threats against her life. The murder was caught on security camera video. On Friday, heavily armed gunmen burned down a lumberyard  belonging to Ortiz’s partner, Jose Monje Amparan. His brother, Manuel, 37, was kidnapped during the attack. He was later tortured, strangled and thrown from a moving vehicle. In Nuevo Laredo, Tamaulipas, over 140 inmates escaped  through the main vehicle entrance of a prison. It is suspected that prison guards were complicit in the escape. The prison director is missing along with the 141 escapees. Soldiers and Federal Police surrounded the prison after the incident. In Zuazua, Nuevo Leon, a car bomb exploded outside a police station, wounding two people. It is unclear whether the two events are related, but the Zetas and Gulf Cartel are both extremely active in Tamaulipas and Nuevo Leon. In Ciudad Juarez, at least six people were murdered  in several incidents. In one incident, a car with Oklahoma license plates was ambushed by gunmen, killing two men and wounding an 18-year old female and three children. In another incident, a man was found dead and wrapped up in a blanket. These killings bring the December total to 130. The yearly total is now being variously being reported as being somewhere between 3,000 and 3,100. In Guatemala, authorities declared a state of siege  in Alta Verapaz province. According to the Guatemalan government, several cities in the province -- including the capitol, Coban -- have been overrun by members of the Mexican Zetas organization. Under the state of siege, the army is allowed to detain suspects and conduct searches without warrants, as well as control local gatherings and local media.